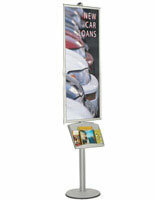 These sign holder stands draw attention with 8ft tall height! The tower-like design is ideal for busy lobbies and passageways. 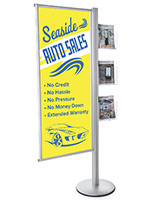 These sign holder stands are tall in stature with a sleek design. 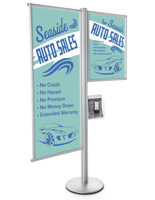 The base and pole of these signage displays are built of sturdy aluminum for stability and a strong foundation. 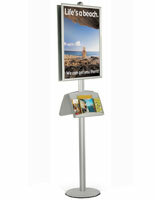 These sign holder stands are double sided, maximizing advertising exposure. 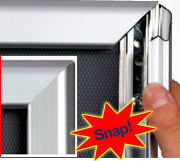 There are two 22" x 56" snap frames and two metal trays included with these units. 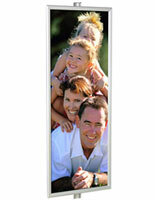 These sign holder stands are a new approach to marketing products or promotions. Users can choose to display these units as a single or double-sided fixture. 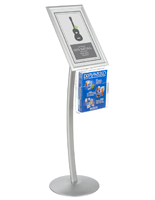 These sign holder stands lure customers to your advertisement and save floor space for other display fixtures. These 8ft tall signage pedestals will last for years while retaining the elegant and upscale look. The sign holder stands use snap open and close edges. Simply lift all four sides, slide in the graphic below the lenses and snap the frame sides closed - done! This unique design allows for fast and effortless graphics changes. 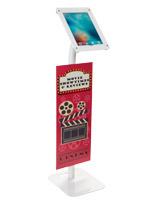 Use these sign holder stands to promote new products or highlight a sales event. Assembly and height adjustment of the frames and metal trays is easily accomplished using the screws on the connector plates at the back of the attachments. 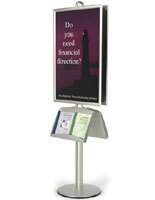 Each of these sign holder stands includes a detailed set of instructions. The powder coated steel trays at the bottom are also built durable and resistant to chipping. Note: When these sign holder stands and metal trays are at their highest adjustment, the height of the bottom of the metal trays is 24" above the floor.